The war in the Donbass region of eastern Ukraine got underway in April 2014. On April 7, 2014, protesters declared the People’s Republic of Donetsk, and affirmed its unity with Russia. Luhansk did not make a similarly formal declaration, but the war in that province between Kiev and Moscow has been equally intense. During the last year, we have seen a discussion here in the United States about the extent of U. S. involvement in the coup that overthrew President Yanukovich in February 2014. Ron Paul advocates the same non-interventionist policy for Ukraine that, he argues, ought to underpin all of Washington’s foreign policy. Oliver Stone says that the Maidan events in Kiev bore signs of CIA involvement, similar to Iran in 1953 and Chile in 1973. Other Americans who follow and document American misadventures around the globe seem to agree with Paul and Stone in this case. 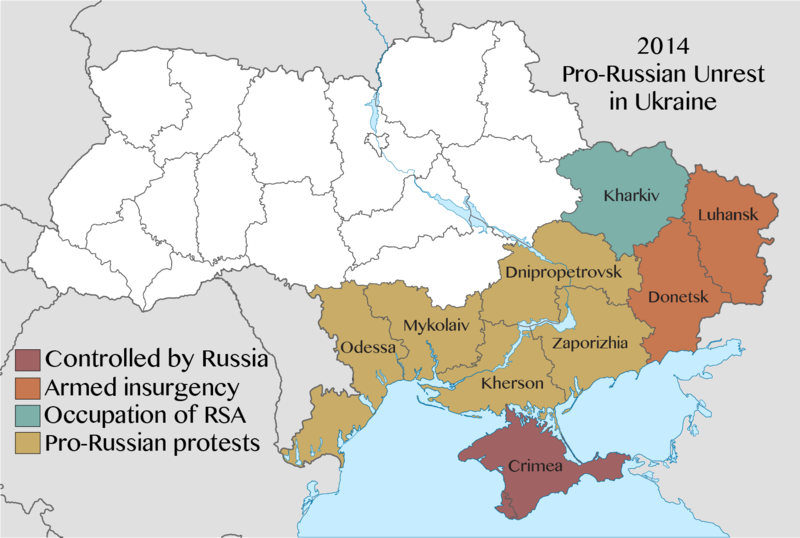 Did the United States help to install a new government in Kiev, in order to draw this large, strategically located country into Western Europe’s orbit? Russian president Putin suggests that is the case, but Putin has no more reputation for honesty than the folks in Washington. For the moment, I will not try to settle the question of exactly how the change of government in Kiev came about. Quite clearly, if Washington did assist the Ukrainian revolution along, it miscalculated. It certainly did not anticipate Russia’s takeover of Crimea, or its operations in eastern Ukraine. In fact, it appears shocked and completely unprepared for them. That makes you ask, how could Washington have pushed so hard to tilt Ukraine westward, and not be prepared for Russia’s reaction? Did U. S. policymakers think Putin would do nothing at all? If they expected him to react, what did they expect him to do? We see no evidence that the United States anticipated or laid plans for any response. We’ll leave these questions open. If you have run across any interesting articles on the war in Ukraine, please leave a link in the comments below.